For many companies that compete in specialized markets, their overall growth/sustainability is often dependent on innovation or, in clichéd terms, the ability to ‘remain one step ahead’ in contrast to their rivals or to satisfy the growing/shifting demands of their customer base. In many cases, the response to such challenges is an investment in new designs and/or new technology, or perhaps seeking financial support from external sources for these purposes. Though deemed necessary for the continued success of the organization, such expenditures may not be the most practical or viable options from a cost and/or operational perspective. In such instances, these companies may find benefit in the prototyping services offered by Noble Precision. 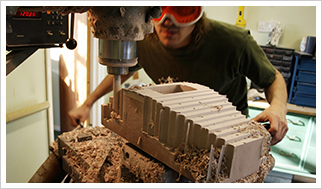 The utilization of this state-of-the-art technology, in tandem with systematic communication and feedback through the manufacturing process, allows Noble Precision and its clients to effectively collaborate on the production of prototypes ranging from intricate components to large-scale models/machines. From conceptualization to precision manufacturing/assembly to rigorous testing and quality assurance, Noble Precision is fully committed to ensuring that each and every prototype meets the specifications and expectations of our clients and their respective business needs. Overcome any potential internal constraints to prototype development by capitalizing on our investment in cutting-edge 5-axis simultaneous CNC machine technology. Call Noble Precision today at 416-938-6455 or contact us to discuss how we might collaborate on your unique, single-unit production requirements.